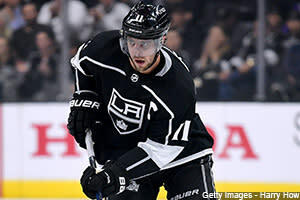 There were two coaching changes in the NHL in the last week as the Los Angeles Kings dumped John Stevens in favor of Willie Desjardins while Chicago gave up on their long-time coach Joel Quenneville with whom they won three Stanley Cups in the last nine years and promoted Jeremy Colliton from their AHL affiliate in Rockford. Colliton is the youngest current coach in the AHL at the tender age of 33. There is a lot of information to get to so let’s get started. Boston, Florida, Montreal, St. Louis, Tampa Bay, Toronto, Vancouver and Washington play three games on the road. Anaheim, Carolina, Colorado, Minnesota, the New York Islanders, Philadelphia and San Jose play three games at home. The Ducks play four games this week so look for Ryan Miller to get in one start with John Gibson getting the call three times. Josh Manson is out with an upper body injury but should be back this week if not earlier. Ondrej Kase has been out of action with a concussion all season but was skating with the team on Wednesday, albeit in a non-contact jersey. Nick Ritchie has been skating in a non-contact jersey as well but he could return from his upper body injury this week. Ryan Getzlaf returned Tuesday from an upper body injury that caused him to miss one game and he scored the game-winner the following night against the Calgary Flames. Antti Raanta could miss this week as he is on the injured-reserve list with a lower-body injury. The Coyotes recalled Hunter Miska to back up Darcy Kuemper but unless there is a blow out, do not expect to see Miska in the net. Jakob Chychrun should return this week from off-season knee surgery. If you are in need of penalty minutes, look at Lawson Crouse who has 24 minutes in 13 games and has chipped in with a couple of goals as well. Dylan Strome has only two goals this season with both coming on the power play. Oliver Ekman-Larsson has two goals and 10 points in 14 games with an impressive plus-six rating. Michael Grabner has four goals and nine points with three goals and a pair of assists coming while shorthanded. He has eight points in his six-game scoring streak. The Bruins play three games in four nights so look for Tuukka Rask to play twice and Jaroslav Halak once. They are getting great production from their top line of Patrice Bergeron, David Pastrnak and Brad Marchand while David Krejci is chipping in nicely with 13 points in 15 games. The problem is that the rest of the forwards are doing little or even less than that. The top scorer of the remaining nine forwards is Jake DeBrusk who had a measly four points in 14 games before a big three-point game Thursday. It’s tough when forwards like Nel Acciari (zero points in 15 games) and David Backes (no points in 10 games) are contributing nothing. Torey Krug has four assists in four games and has taken over his rightful spot on the number one power play from Matthew Grzelcyk who replaced him when Krug was injured. Jeff Skinner has been great for the Sabres as he has 11 goals and 18 points in his first 16 games with Buffalo. He is one point behind team leader Jack Eichel. Sean Malone is back from a knee injury suffered at training camp and was sent to Rochester of the AHL. Rasmus Ristolainen was a minus-102 in 346 NHL games heading into this season but he has not improved, in fact, he has been worse this season with a minus-12 in 16 games. Carter Hutton has been okay with a 5-6-1 mark to go with a 2.78 GAA and a .911 save percentage but backup Linus Ullmark has been sensational with a 3-0-1 record, a 2.00 GAA and a .934 save percentage. It would not be surprising if he worked his way into a share of the starting job or better than that. Sean Monahan was the first star of the week as he had four straight two-point games last week including four goals. Monahan has 18 points, tied with Matthew Tkachuk, one behind Johnny Gaudreau and one ahead of Elias Lindholm. While Lindholm has been a stud since his trade from Carolina, Noah Hanifin has been playing well but has not been a fantasy asset as he has only four assists in 15 games. Mike Smith has been struggling in the Calgary net as his record is okay at 5-5-1 but his peripherals are not as he has a 3.66 GAA and a .872 save percentage. Dillon Dube is on injured reserve and he may have a concussion. The Hurricanes play all three games at home this week. They seem to be the most interested team in the William Nylander talks as the Maple Leafs and their talented winger have yet to agree on a new contract. The Hurricanes are believed to be offering either Brett Pesce or Jaccob Slavin, both young defensemen. Petr Mrazek is day-to-day with a lower body injury. The trade that sent Elias Lindholm and Noah Hanifin to Calgary has worked out for both teams in the early going as Micheal Ferland has a team-leading seven goals and 11 points while Dougie Hamilton has a couple of goals and five points and leads the Hurricanes with 66 shots on goal. The Blackhawks got their week off on a different foot as they fired their long-time coach Joel Quenneville who took them to three Stanley Cup wins in his 10-year tenure with the team. He was replaced by the Blackhawks AHL affiliate coach Jeremy Colliton. Colliton becomes the youngest coach in the NHL at 33. Corey Crawford should get the net three times this week as the Blackhawks play four games. He has struggled this season after missing 10 months with a concussion as he is 3-4-0 with a 2.92 GAA and a .907 save percentage. Brandon Saad has picked it up of late as he has four goals and five points in his last seven games. Nick Schmaltz had a big season last year with 21 goals and 52 points in 78 games. He is not off to a great start this season with only a goal and seven points in 14 games and was a healthy scratch in Edmonton on November 1. Tyson Jost is still out of the lineup with a head injury and has missed the last four games. He has been a disappointment this season as he had 12 goals and 22 points in 65 games as a 19-year-old last season but has only a goal and two points in 11 games this campaign. He practiced in full gear Tuesday but still did not play Wednesday. After starting the season at 4-0-2, Semyon Varlamov has lost his last four straight, giving up nine goals on 70 shots in his last two games. Still, he has a 2.21 GAA and a .934 save percentage on the year. Tyson Barrie has 11 assists and is a plus-nine this season after 15 games. He has been a combined minus-65 in 220 games over the last three seasons. Oliver Bjorkstrand was banished to the press box on Tuesday, the first time this season that he has not been in the starting lineup. Bjorkstrand had 40 points last season and it was thought that another leap forward was within his grasp but he has only a goal and three points this season in 14 games. Sergei Bobrovsky’s numbers don’t look great a month into the season as he is 4-6-0 with a 3.09 GAA and a .902 save percentage but he has allowed only one goal in three of his last four games and has stopped 119-of-126 shots in that time frame. Zach Werenski is off to a nice start this season with three goals and 10 points in 15 games. With the return of Brandon Dubinsky to the lineup, Sonny Milano was sent to the minors. The Stars recalled Denis Gurianov from the minors where the winger had six goals and 12 points in 11 games. The Stars are in need of some secondary scoring as Tyler Seguin, Jamie Benn, the injured Alexander Radulov, Jason Spezza and Devin Shore are off to good starts but there is little other scoring on the Stars up front. Radek Faksa and Jason Dickinson each have three goals in 16 games and they are the best of the rest. Seguin had gone 12 straight games without finding the back of the net before scoring Thursday and has four goals and 16 points in 16 games. Martin Hanzal is expected to be back at or near the end of November and has been given the green light for some light contact in practice. The Red Wings have been hot of late, winning four of their last five games to climb out of the cellar of the Eastern Division. Dylan Larkin missed practice on Wednesday but said he will be ready to go on Friday. He has six goals and 15 points in 15 games this season. Frans Nielsen has missed the last four games with a concussion but is trying to remain patient. He hopes to return on Friday but that may be a reach. Andreas Athanasiou has also missed the last four games with a leg injury but his return looks a lot better for the 9th of November. He had four goals in the six games before his injury. Michael Rasmussen saw his three-game points streak end on Tuesday. He scored twice in the streak, both on the power play. Congratulations to Ryan Strome who broke a 14-game pointless drought on Tuesday with his first goal of the season. Milan Lucic was fined $10,000 for his hit on Tampa Bay’s Mathieu Roy Tuesday. He has only a goal and four points in 16 games this season but does have 30 penalty minutes. Leon Draisaitl has scored in three straight games and coach Todd McLellan was looking for a spark and used Draisaitl and Connor McDavid on the same line in the third period Thursday. The Oilers have only three goals from their defensemen in 16 games with one coming from Evan Bouchard who is back in junior hockey, as well as Jason Garrison who has been a healthy scratch on numerous occasions. The Panthers have struggled all season but are playing much better with Roberto Luongo back in action. Luongo has a couple of wins of late including a 4-1 victory over Edmonton and has a 1.19 GAA and a .959 save percentage. James Reimer did not do the job in Luongo’s absence and there should be some worry in the Florida camp as to what to do when Luongo needs a rest. Evgenii Dadonov has a three-game goal scoring streak and has seven goals and 14 points in 12 games this season. Derek MacKenzie is out indefinitely after undergoing successful shoulder surgery. Mike Hoffman had a pair of assists Thursday and has a 10-game scoring streak. The Kings fired John Stevens this week and replaced him with Willie Desjardins as the Kings fell to the bottom of the Western Conference standings. Ilya Kovalchuk saw his four-game points streak come to an end Thursday but still has 14 points in 15 games. Jack Campbell, who has taken over from the injured Jonathan Quick, has given up only four goals in his last three games on 81 shots. Dion Phaneuf is still pointless 15 games into the NHL season and if you took him in your fantasy league, you must be kicking yourself. Tanner Pearson is not a lot better as the forward has yet to score and has only one assist. Anze Kopitar has only four goals and six points in 14 games after a 92-point season in 2017-18. The Wild play four games this week including three games in four nights. Devan Dubnyk should get the start in three games with Alex Stalock starting once. Mikko Koivu has been hot of late with five points in his last two games. He has two goals and 11 points this season. Matt Dumba has five goals this season as well as eight points in 15 games. The Wild are scoring from the blueline as in addition to Dumba’s five goals as Ryan Suter and Jared Spurgeon each have three while Jonas Brodin has a couple. Congratulations to Zach Parise who became the 32nd American-born player to pick up 700 points in their NHL career. The Canadiens play all three games in Western Canada this week. As I write almost every week, Max Domi has been a stud with Montreal and is up to nine goals and 19 points in 16 games. He had only nine goals in each of his last two seasons with Arizona and the change in scenery has done wonders for his confidence and career. Joel Armia is out six-eight weeks with a knee injury suffered on Tuesday. He had three goals and seven points before the injury. Paul Byron is week-to-week with a lower body injury. He has already missed five games. He has back-to-back 20-goal seasons but may have a tough time reaching that plateau if he can’t return soon. Jonathan Drouin has two goals and four points in his last three games and has five goals and 12 points in 16 games. The Predators play four games this week including three games in four nights. While most think that Pekka Rinne will play three times and Juuse Saros only once, I think that the Predators could split the net this week. Viktor Arvidsson should be back in action this week as he has been out with a lower-body injury. He has eight goals and 12 points in 12 games. Colton Sissons had only a goal and two assists this season before his hat-trick on Wednesday. Ryan Hartman has been given a look on the top line with Ryan Johansen and Filip Forsberg and if he can stay there when Arvidsson returns, then his fantasy value will skyrocket. The Devils play four games this week with three games in four nights. Look for Cory Schneider and Keith Kinkaid to split the net. Schneider has a 0-2 record this season with a 4.71 GAA and a .862 save percentage. The Devils will get Jesper Bratt back on November 9 as he has recovered from a broken jaw suffered in Sweden. Taylor Hall has 15 points in 13 games this season and has been held off the scoresheet only twice this season. He has 10 assists on the power play already. Kyle Palmieri has five goals and nine points on the power play as part of his 10 goals and 17 points this season. Will Butcher had a strong rookie campaign with 44 points and has a goal and seven points in 13 games this season. Michael Dal Colle is finally playing well at the AHL level. He was taken fifth overall in 2014 but has had a tough go of it at the professional level as he had 24 points in 60 games at Bridgeport after 41 points in his rookie AHL season. Joshua Ho-Sang has also been strong at the AHL level with a goal and 14 points in 13 games. Nick Leddy is still struggling with only three assists in 15 games this season. Josh Bailey leads the Islanders with 17 points, four up on Mathew Barzal and Anders Lee. Lee leads the team in penalty minutes with 23. Thomas Greiss continues to shine with a 4-2-1 record, a 1.98 GAA and a .940 save percentage. Robin Lehner is playing well as well with a 4-3-1 mark, a 2.53 GAA and a .924 save percentage. The Rangers future has centers Lias Andersson and Filip Chytil being a big part of it but for now the two are linemates on the fourth unit with Chytil moving from center to the wing. Mats Zuccarello is out with a groin strain but the Rangers hope he is back this week. The two games that Neal Pionk missed as a healthy scratch earlier in the season seems to have worked wonders as he is the Rangers top offensive threat from the blueline, better than Kevin Shattenkirk who has only three assists in 14 games. Brendan Smith is second on the team in penalty minutes with 27, five behind Cody McLeod. Brett Howden is back after missing one game with an upper-body injury suffered on Sunday. The Senators got a big boost Thursday as he returned from a leg injury after missing nine games. He was held pointless and has three goals and six points in five games. He should be in your lineup. Thomas Chabot is amazing. He is tied for third in NHL scoring with 22 points and as it has been mentioned in previous columns, is making everyone in Ottawa forget about the offensive prowess of Erik Karlsson. If the fans haven’t forgotten, they should. Matt Duchene has a goal and four points in his last two games but the big story with him and the Senators was how he and some of his teammates were caught on an Uber camera dissing an assistant coach. Mark Stone has six goals and 19 points in 16 games this season. The Flyers complete a five-game home stand this week. The Flyers are still having problems between the pipes and Calvin Pickard did not help matters Thursday as he was pulled after giving up four goals on only 18 shots. He is 3-1-1 but has a 4.41 GAA. Brian Elliott is not a lot better as he does have a 2.93 GAA and a .899 save percentage. That is not going to do it at the NHL level. Ivan Provorov returned to form on the West Coast and played extremely well but upon his return to Philadelphia, he reverted back to earlier season form and was a liability. Michael Raffl is out of action for a few weeks with a lower body injury and should return in late November or early December. The Penguins are struggling at this time as they are 0-4-1 in their past five games. Frustration is building up, led by Evgeni Malkin who was fortunate to not get suspended for his illegal hit on the Capitals T. J. Oshie Wednesday, although he managed to pick up 12 penalty minutes to give him 22 this season. He is pointless in his last three games while linemate Phil Kessel has only one point in his last four games. The Penguins were hoping that Daniel Sprong would be a top-nine forward this season but he has yet to score and has only four assists in 12 games. He has been playing on the fourth line when he’s not in the press box. Jamie Oleksiak has four goals and eight points with 15 penalty minutes and a plus-four rating thus far. Pick him up in deeper leagues if you need help on your blueline. The Blues are on the road for all three games this week and they play all three in four nights. They are not getting good goaltending so look for Jake Allen and Chad Johnson to each play once with the hot goalie playing the extra game. The Blues are second-last in the Western Conference (only better than the Kings) and they have to be thankful that they dealt for Ryan O'Reilly who has seven goals and 19 points in 13 games including all seven goals and 15 points in his eight-game scoring streak. Where would they be without him. Likely in dead last. Brayden Schenn missed Tuesday’s game with an upper body injury but should be back this week, if not earlier. Robby Fabbri scored Tuesday for the first time in almost two years as he last scored on December 12, 2016. Congratulations go out to Joe Thornton who played in his 1,500th game on Thursday. He has 399 goals as well as 1,032 assists in his Hall-of-Fame career. Timo Meier is tied for the NHL goal-scoring lead with 12 goals along with Patrick Kane, Alex Ovechkin and David Pastrnak. That is elite company. Tomas Hertl has missed the last two games with a head injury and the Sharks miss his offense. Brent Burns has 20 points in his last 15 games. Erik Karlsson has only seven assists in 16 games with nary a goal. He has gone five games without a point and he could have a hard time garnering the contract he is expecting if he doesn’t start scoring. Martin Jones is 7-4-1 with a 2.84 with a .893 save percentage. The Lightning are on the road for all three games this week. Ondrej Palat will be out of action for another four weeks with a lower body injury. They are hurting with Victor Hedman still out of action but he has been practicing and is close to returning to action. Brayden Point was named the third star of the week as he had two goals and six assists in four games. Point leads the Lightning with 19 points, one better than Nikita Kucherov and two better than Yanni Gourde. Ryan McDonagh leads all blueliners on the Lightning with 12 points. Steven Stamkos has five goals and 10 points in his last six games. Andrei Vasilevskiy continues to show why he is among the best goalies in the NHL as he has a 9-2-1 mark to go with a 1.98 GAA and a .937 save percentage. The Maple Leafs are in California all week and play three games in four nights. Frederik Andersen will get two starts with Garret Sparks playing once. Still no word on the William Nylander front as the RFA is still not signed. Connor Brown doubled his goal total on Tuesday with a goal against Vegas. Frederik Andersen made 36 saves Tuesday in the 3-1 win over Vegas and has a 8-5-0 with a 2.18 GAA and a .929 save percentage. The hope is that he is not overused before the start of the playoffs like last season. Auston Matthews skated and took some shots on goal before practice this week but don’t expect him back before the end of November at the earliest. Mitch Marner leads the Leafs with 19 points, two better than John Tavares. Toronto has yet to lose in six road games. The Canucks have looked so good when Elias Pettersson has been in the lineup as he has 10 goals and 17 points in 11 games. He was the NHL’s rookie of the month in October. Brock Boeser has been sent home as he suffered a groin injury and the medical staff wants him checked out to make sure it is not more serious than that. Loui Eriksson had two goals and an assist Thursday against him former Boston teammates to give him nine points in 17 games. Ben Hutton did not score in 61 games last season, but has four already this season in 17 contests. Bo Horvat had two goals and four points against the Bruins and is up to 14 points this season. The Golden Knights continue to spin their wheels as they attempt to climb back into the Western Conference playoff race. Erik Haula suffered a lower body injury and was stretchered off the ice against the Maple Leafs but could be back in action this week as he remained with the Golden Knights through the remainder of their road trip. Cody Eakin centered the second line in Haula’s absence Thursday. Nate Schmidt has started practicing with the Knights on Wednesday and is eligible to return from his 20-game suspension this week when Vegas takes on the Oilers in Edmonton Sunday. He has been missed. Tomas Nosek has only one goal in 14 games with a minus-10 rating. The Capitals play three games in four nights so look for Braden Holtby to play twice with Pheonix Copley seeing action once. Holtby was sensational Wednesday as he stopped 41-of-42 shots in a 2-1 win over Pittsburgh but even that effort only brought his GAA down to 3.37 while raising his save percentage to just a tick below .900. Evgeny Kuznetsov has six goals with all coming on the power play. Andre Burakovsky has only a goal and an assist in 14 games. Alex Ovechkin has 12 goals and 18 points in only 14 games. Chandler Stephenson is playing on the second unit with Nicklas Backstrom and T.J. Oshie as coach Todd Reirden wants a defensive presence on the unit. The Jets play only twice this week for the third straight week. Brendan Lemieux received a two-game suspension for his illegal check on Vincent Trocheck in Finland. Patrik Laine is seeing action on the third line with Adam Lowry and Brandon Tanev but continues to play on the first power play. He has seven goals and nine points in 14 games with six on the power play. Unlike the rest of the NHL, the Jets have been spending a lot of time in the penalty box as nine players have double digits in minutes including four with 20 or more minutes. Lemieux leads with 27 but has yet to pick up a point in nine games. Blake Wheeler has 10 power play points with all being assists. They end a four game home stand this week.